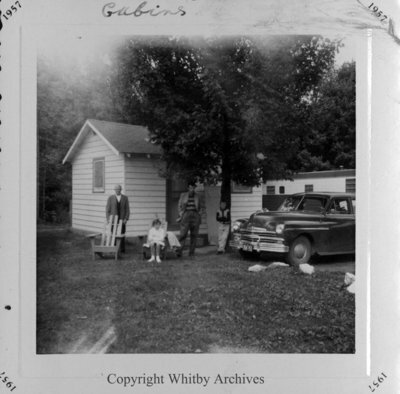 A black and white photograph of the Smit family standing outside of a cabin at the Algoma Tourist Camp in 1957. In this view from left to right: Mr. Frans Geldof, Willemyna (Willie) Smit, Mr. Willem Smit, and Hendrik (Hank) Smit. The Smit family stayed at the Algoma Tourist Camp in 1957 when Mrs. Smit's father (Mr. Geldof) came from Holland for a visit. Top of photograph "Cabins" is handwritten. Algoma Tourist Camp, 1957, Willem Smit. Whitby Archives A2014_026_001.